This week keeps getting weirder and weirder…Come on guys I am running out of popcorn and in middle of snow storm…. Thank you Sundance it gives us all hope and belief. It is great to have Sundance spell it out for idiots like me. I have YET to see any indication from ANYONE that ANYTHING is going to happen to bring any of these people to justice. What am I missing? Trust me, you are no idiot. All one has to do is go to AOC’s twitter and read away. It makes a person feel better about themselves as they get a REALLY big laugh at the tweets. That is a simple but salient point that I think we need to always remember. Its easy to get discouraged when it seems like nothing is being done in the name of justice. But Trump winning the presidency was, in itself, a yuuge plate of justice being served. The fact is, it seems our government has been FUBAR for a long time, and the election and presidency of Donald J. Trump has exposed it. I certainly did not realize the depths of the corruption in our government, on both sides of the aisle, the Uniparty, the globalists, etc…. At least it is now being exposed. Its human nature to get impatient after we realized the depths of the attempted coup, the cover-up of Hillary, our totally FUBARed DOJ, etc, etc… But I think we have to accept the fact that the wheels of justice grind slowly and this is just going to be a long war that we are going to have to get up and fight every day, for a long time. Its easy to get exhausted when we wake up everyday thinking a big hammer is going to drop. This is a test of our endurance. Let’s see what happens when Barr gets confirmed. Whittaker knew his appointment was temporary and his testimony showed he was aware of much, he disagreed with it, but there’s no point for him to instigate investigations until Barr is in place. I fully believe that documentation of all these details is a big factor in future justice. Yes, thank you SD for writing it all out. It cannot be undone. I agree, Peoria. Sundance has revealed it and it can never now be completely hidden again. Thanks also to To Fitton at Judicial Watch. They will also (along with CTH) be getting a donation from me again tomorrow. Sundance does a lot of good reporting & investigating. kinthenorthwest, many superlatives added to that sentence would be justified, for sure. Parsimony has no place, when characterizing Sundance. Where and how he gets such amazing inside information, in such detail, is truly a wonderment. It’s well beyond “good reporting and investigating”. The cost, in dollars, is also significant! If Bondo Barr reads nothing else, he should read this article. (And he should get the unredacted text messages) Sundance, you nail it once again. I don’t know if your last paragraph is totally correct, because I think Mueller would do just about anything for the people he mentored and he has as much to cover up as the small group does, but this small focus piece is illustrative of the entirety of the Clinton email investigation and obviously ran alongside Spygate with many of the same people involved in both. Yes “Sundance” does a great job. I think he is on the trail…always has been. But I do not understand why it does not translate. Tired of the accolades and great job ol boy…what, why and how need to be answered and mostly…why not? William: The answer is very simple. The msm are not covering any of this! So this never happened! The number of people who read SD’s work are only in the thousands! If we treepers try to educate those around us we get labelled as right wing nuts and ignored! I dont think Mueller is looking to close up shop. Why should he be afraid of Barr? The bottom line is very few folks are keeping track of all these shenanigans. The average American doesn’t have a clue. The big question is why POTUS doesn’t demand his DOJ start prosecuting the corrupt Deep State officials? Very important! But if you’re anti-social media like me, you talk to people and email the articles/posts. Because “no holds” soon to be “no holds BARRed”. Barr is coming in to smooth everything out…..mistakes have been made. He is going to institute some very tough reforms don’t you know? There is going to be real accountability FROM HERE OUT. so this never ever happens again….he isn’t going to investigate this other then in terms of some sort of announcement of reform of DOJ FBI practices. There will be some token resignations maybe a firing or two. Thats it. How are they all not being prosecuted and/or disbarred? This is horrendous!! Well, it sure would be surprising if the tables indeed turn, wouldn’t it? Golly, Gomer, what did you later think would be the effect on President Trump to be under the same cloud–at your doing no less?? Proves the premeditation of Comey. He feared buggering Clinton’s presidency and turns around and feigns horror that President Trump would feel the same way as a victimized Clinton would. This guy is stoopid. Spelling Nazi here. You left out a few ‘o’s in stoooooopid. So what do they do…they make Trump the subject of a fake investigation. Voila! Will we ever find out what was on Weiner’s laptop? That is the big question. Wieners laptop has everything on it. It is the holy grail of corruption. When the contents of that laptop “magically” re-appear, damn straight they will “all be hanging from nooses”!! Will someone from the NYPD PLEASE step up and be counted as honest! That laptop or the contents of that laptop will never be made public. At least for the next 20 years or so. Even if the laptop content wasn’t destroyed (someone has a copy) the content will be deemed “classified”, you know the drill. whomever got a hold on the Weiner laptop, immediately it was copied widely and fully and spread around to key criminals. The ‘laptop copies’ are insurance policies, hole cards, ready and waiting. Trouble coming, asses in a sling. hope so but isn’t it whoever? IG Report page 294 lists what is on the laptop from FBI agent in Washington interviewed by IG. Last line on the list = “CRIME AGAINST CHILDREN”. NYPD found this first and threatened arrests until Loretta Lynch shut them down. But wouldnt that be Weiner sexting/emailing with a minor? The crime against children? Is there another crime listed that covers Weiners perverted and pedophilic actions that would make this “Crime Against Chlidren” be something else, related to the Clintons? Maybe this is why the senate opened an investigation into the Jeffrey Epstein (convicted Pedo) conviction? Just an observation from all the Treepers and a thought popped into the brain matter…If the FBI agent was so distraught about “wiping” his computer of all evidence, and since this is NEW YORK…I do believe that one individual has ALL THE EMAILS…RUDY GUILIANI…PDJT hired him in April ’18? and has kept him on staff. 3) Judges are being confirmed in goodly fashion. Reason: IF these perps are allowed to walk,..WE WILL NEVER HAVE A JUSTICE SYSTEM THAT IS TRANSPARENT AND ABOVE ALL ELSE…FREE FROM THE INJUSTICES AND DUPLICITY THAT WERE INFLICTED ON A DULY ELECTED PRESIDENT. Don’t forget, when this President leaves office, he wants the mess cleaned up because like a good neighbor he doesn’t want this to happen to anyone else AFTER he is gone…So yes, this is going to be released in due time!!! livefreeordieguy, I remember hearing, way back when, that Rudy got a copy of the Wiener laptop. Surely he would have put the safety of it as top priority. Also, every piece of info on it would have gone to the NSA data base in real time, as it happened, right? Or am I incorrectly characterizing that data base? Mad Max says EVERYTHING about EVERYONE is on it! It was just a rumor I read. Hillary’s server was used as a intel library for countries willing to donate to the CF. Her and Ovomit were also selling you name it they sold it (Mil secrets to guns, tanks, warships, nukes). The secrets they were selling were also secrets from other countries enough to start WW3. Weiner’s lappy has all the Satan stuff like Prince mentions. Maybe thats how the idea originated? He contemplated the ramifications of a President being under FBI investigation (Hillary) with horror, thinking how much it would handicap a new administration. Except they started spygate way before the election….it began in at least late 2015, with the hiring of Nellie Ohr at Fusion GPS, the Podesta-Clinton meeting about creating a Russia Russia drama against whoever became the Republican nominee….and OVomit unmasking Americans. It didn’t just start at the election of Donald Trump. Dan Bongino (using reporting by John Solomon) has recently discussed the revelation that the Russian collusion story FIRST appeared when John McCain was running for President in 2008, and Hillary Clinton was running for the Democratic nomination. Hillary hired Fusion’s people to do opposition research on McCain, found some Russia connections to exploit and was gearing up to run with the damaging goods (never mind her own Russian connections). Bush’s IC people saw what was in the works, warned McCain, and he escaped. The plan was simply dusted off for 2016, a few names changed, and voila! Of course, Trump did not have any warning from any Obama IC component that there are people “out there” that it is probably best to avoid. It’s ironic, t hey worry about the effects if it’s Hillary, but revel in them when it’s President Trump. This is exactly what I thought as I read the article! Ya know what’s kinda (maybe) interesting… unless his name is redacted, I don’t see Andrew McCabe (he of “Andy’s Office” fame) on the email thread. Lisa Page is there, though. Was McCabe already in the proverbial Doghouse? If redacted, why? We don’t who and when these were redacted. McCabe could have been one of the redaction editors. My old articles here: https://dailycaller.com/2018/06/22/fbi-ignored-golden-emails-and-abedin-messages/ and prior at https://dailycaller.com/2018/06/19/fbi-doj-and-hillary-clinton-weiner-problem/ but Sundance puts it all together here perfectly. I think Mueller is in it all up to his eyeballs as he had to have been emailing Clinton on her unsecured server and known exactly what he was doing. He IS the insurance policy. Nail on the head, Sidney. Mueller is the insurance policy for sure. I thought it was Sessions but I now believe he was simply duped. Great to see you here. “It” and “lots of other stuff”. The Apple (Comey) doesn’t fall far from the Tree (Mueller). It’s not an accident Mueller was chosen for this gig. IMO. Thank you ma’am for including those articles. They are must-reads for refreshers and for those new to this investigation. Those not familiar – check out Ms Powell’s book License To Lie and her website Creeps On A Mission. Answers many back-story questions about Mueller and the Mueller team, Andrew Weissman in particular. These are Very Bad people. Sidney, you and Sundance are the go-to people on all of this. Do you foresee ANYTHING being done about any of this when Barr takes office or will it just be more of what we have had for the last 2 years? Sidney, a true Patriot, can answer for herself… but my money is on “B”. Hope I’m wrong. Thank You! The articles you included are excellent refreshers. There is so much happening DAILY that some of it can be forgotten. Your statement that Mueller was emailing Cinton on her server suggests that Mueller was involved in deep state operations meddling prior to his placement as SC. If so, how long has Mueller been involved in this scam? Similarly to Sydney Blumenthal? Many years? How can Barr, not investigate the investigators at this point? There is so much evidence that IMO points to a true conspiracy, cover-up and frame job. It would be so dishonest IMO if Barr takes the easy way out and sweeps this all under the rug. I am right with you there, bogeyfree! To me, its more important than a wall, illegal immigration, or anything else. If we dont have justice, we have nothing to preserve anyway. Mueller didn’t leave his job at the FBI until September 2013. Hitlery left hers February 2013, so, of course, if they exchanged emails, he knew she wasn’t using a government-secured server. And I believe it was Hitlery who ordered Mueller to take the “reputed” uranium sample from a Georgian uranium heist to Moscow. OK. So my question has been with Mueller continuing to pull strings after his ‘exit’. I may have answered my own question with your assistance! Sidney Powell, YOU are one of my top 3 heroes! TY!!! Deb, have you seen Sidney’s interview with Mark Levin on his TV show Life, Liberty & Levin? She’s superb (when he gives her a chance to answer his questions)! Sidney, we are all so grateful to you for all the work you have put into bringing to light the revelations about the tag-team abomination known as Mueller and all his ilk. I suspect that laptop is The Ring of The Fellowship that must be destroyed, so I am curious if you think it has already gone into the fires of Mount Doom? Is it even remotely possible that some LEO or noble attorney would have stashed it somewhere for safekeeping? There were rumors that Rudy had been given a copy of it by NYPD but he is all over the map lately and I don’t what to think about him…he and the President are very close so IF Rudy has a copy then Donald Trump does as well. Sidney, any thoughts? I don’t think the NYPD ever had their hands on the Weiner laptop. Despite what Erik Prince said in the Breitbart interview. Weiner’s lawyer give to SDNY(Preet) & they turn over to FBI NY. Weiner was prosecuted by the Feds for his texting and what have you. I just don’t see the feds sharing it. We also would have had some sort of leak by now. I am convinced that laptop has all the Hillary emails, as well as a ton of Foundation correspondence. Mueller and ” and even by other Democratic members of Congress was so disgusting they gave it to the FBI”, and likely many more in the swamp. It explains so much if Hillary had been collecting dirt on so many, and it explains so much why they are fighting as if their lives depend on this never going anywhere. How many Democrats visiting Epsteins island? How many RINO’s? Look at Alex Acosta and his corrupt plea deal. Lying. Money-laundering. Corruption. Selling access to the highest bidder. All of that is lawless and thoroughly corrupt. All of it is expected when a Clinton is involved. What I would like to know is, what would be so heinous as to be described as “disgusting” by the NYPD? Surely they would all be familiar with the Clinton’s and their crimes. In my opinion, disgusting means much more than just the typical Clinton criminal actions. I think the NYPD agreed. What a bunch of slimeballs. It’s the Dept. of Just-us. It’s a big club, but y’all ain’t in it. skylark2016, I’d give you 1,000 ‘Likes’ if I could… First donation is to CTH, second is to Judicial Watch… Both doing the job that the people who are SUPPOSED to be doing the job won’t do. Yes,I donated to bothat the end of the last 2 years! Best investment into our future. Then buy books. I said the same above, Skylark and Livefree! Donations to CTH and JW. Livefreeordieguy, thank you for your post. Many people don’t realize how it works because unlike many others, CTH does not solicit. Sincerely hope we’re all tossing them a few $. What we still don’t know with any certainty (any spoken or written evidence that implies..) is the whereabouts of the laptop or if copies of the emails were made by NYPD. Certainly the data on the laptop is nuclear-level evidence that PDJT may know about and, IF NYPD secretly made copies and got those copies to the Prez, he is holding as ultimate leverage. But I would not think he could even hint that he has anything yet that is this “red hot”, because his enemies would be far more cautious in their scheming and more difficult to ensnare. Somehow, I believe that the NYPD gave RUDY G a copy of what was on that laptop. And I have to believe that Weiner made copies for himself as an insurance policy. If Eric Prince knows so much about the information acquired through the SDNY, then how did he get to see so much? If Eric Prince knows, then POTUS knows….it is very reassuring that Prince knows so much. Does this make sense? I don’t believe Prince actually SAW anything, I THINK he was just TOLD about it. Something this HOT, it would be very difficult NOT to tell someone. But, by the same token, with something this HOT, you don’t pass it around for everyone to peruse. And, when it comes to 1PP, (NYPD top brass) this surely isn’t the first time they have known about something politically explosive, and decided it was best to keep it in their pocket. … and furthermore, who was Prince’s “source”? – has he said, even if only alluding? I haven’t followed that aspect closely, just hoping for a quick answer from someone who has. I think Prince’s sources are in the NYPD. Like Rudy, he has ties to the NYPD. You can bet that Trump supported the BOYS in BLUE in NYC… and I would be willing to bet that because Rudy has alluded to the contents of the LAPTOP Trump knows what it contains. This President has been absolute in his support for the Thin Blue Line and it has not gone unnoticed! After the obvious disdain, contempt, and sometimes open hatred for LEOs from the last administration, I really pray that IF NYPD has a copy of Weiner’s laptop, then they will make sure it gets into the hands of those who need it!! And what about 650,000 emails on one mans laptop. If he had sent and received a total of 100 emails per day that’d work out to be almost 18 years of emails. That laptop wasn’t that old. Or else it had every email he ever sent or received since the turn of the century. Doesn’t seem realistic. Was it 650K emails or 650Kb of emails? Something mistranslated possibly? GB how many of the emails are pictures? How could we even guess? Also, the format of each email – rich text or plain text – affects file size, along with attachments. Reading Sundance’s article from last July does seem to reinforce the assertions that there were 600K+ separate emails on the laptop. Specifically, the statements from the NY agent who initially investigated the laptop and reported the serious content he found, seems to affirm the high volume figures. Only reaffirms…laws are for we not thee. New boss same as the old boss. I think PTrump knows answers of all these questions. Mueller is there to save establishment and deep state. It seems PTrump does not want to blow whole thing so people have no trust on govt or waiting for Muller to go. POTUS is interested in moving forward…and knows he can’t take down the DOJ/FBI alone (virtually alone). I think there’s been some sort of unspoken deal brokered. And when it’s all said and done, no one of any significance is going to jail-Barr will try to reign back in the DOJ but won’t destroy the institution in the process. NO!!!! This is why the judges that PDJT has put into place will counter-act whatever the deep states throws their way. Also, the Supreme Court will play a role and RBG is either on-board or near the time it HAS TO BE DECLARED THAT SHE IS NO LONGER ABLE TO CARRY OUT HER DUTIES. Kendall’s original email only went to Baker and one other individual, redacted. And then Baker sends it out to the small world. Amazing. Some people just do not realize what they are doing. And who was the only other original recipient on the thread? Hmmm. WSB, do you have a guess? Intriguing question. Well, Baker is in the legal department. Clintons attorneys would want legal technicians or decision makers. Comey’s name was on later emails and unredacted. Would it have been someone in Mueller’s circle himself? This question burns my brain. Because the answer could be so simple. It would I think only be in the FBI or at DOJ. But Baker is the first name on the ‘To’ address, the other is second…so there is hierarchy there, no? Who was under or equal to Baker? Comey actually said, “what if a prez got elected and everyone found out there was an active FBI investigation on him/her”???!! He say that, as if it would be a bad thing!! Yet, this is exactly what they were all involved in??!! Projection. Yet again. So predictable. That makes me curious, but I don’t think I could handle Coney memoir. His overly dramatic tweets are too much. Comey sounds conflicted in so many ways. I think Comey has “cognitive dissonance” between his self image as an upright, uber-moral Boy Scout vs. how others perceive him. So Comey often works himself into knots to try to justify himself (to himself as well, perhaps). But that still small voice of the soul–the one that speaks truth to us about our shortcomings and sins, is still bothering Comey. Comey knows he did wrong, and since he was a one-time altar boy, he also knows that God knows ALL of our innermost secrets. I read a book something like 30 years ago called “People of the Lie” which perfectly describes Comey and the hell on earth he has created for himself. Yes, his primary lies are to himself first. Therein lies Comey’s dilemna. He is conflicted. He doesn’t know if he is “amazing!!! !” or merely “extraordinary!!!!”. What I would like to know, SD……Is, when is the book coming out and who is doing the screenplay? Just a matter of perceptions. They never even looked at the laptop, right? Also neatly explains why SDNY keeps popping up alongside Mueller. That office has plenty they would prefer to keep hidden (or rather under investigation for eternity). Thanks for the article Sundance, it is REALLY appreciated. I read about this earlier today on the JW site. The timing of the conversations and the conversations themselves, between the Fed and Hillary’s Atty., is a BIG deal IMO. It appears to me that there was collusion between the DOJ/FBI and Hillary to cover her illegal activities above and beyond what I could imagine. Will we see this whole mess resolved under the rule of law, or is the rule of law and it’s equal application non-existent in America? sundance, a true Patriot, can answer for himself… but my money is on “B”. I hope I’m wrong. So my question: Is the Clinton campaign more like Al Capone with the FBI being more like Frank Nitti, or is Clinton campaign more like Frank Nitti with the FBI being more like Al Capone? I guess it would be more the former. Morally speaking, the Clintons are far worse than Capone. Capone readily admitted he was a racketeer, and as such had to operate in a world of corrupt police captains and judges. The Clintons pretend to be our guiding lights, who support the working people of our nation, They are depraved, power hungry grifters, and have sold out the American people. First Satan created the Mafia. That was just for practice. Then he created the FBI. Has anyone considered that the main objective of the phony FISA warrant here was to prevent Hillary Rotten’s emails from ever reaching anyone on the Trump team? The FBI, Klapper and Brennan knew the server was compromised. They also knew (or suspected) that Hillary Rotten was not the only one using sending and receiving emails using the unsecured server. There was also others — Mills, Abedin, and probably the big fish Obamanable himself. So the objective was to intercept the emails to prevent the whole lot of them from being exposed. Clapper, Brennan, Obama, Huma, Val Jarrett, McCain, Mills, Lynch, Comey, Susan Rice, et al. They all used private emails. Indicting Clinton would have been indicting themselves. Makes you wonder even more about the “security” of the Democrat House server under the Awan IT crew from Pakistan. Wonder if it was ever breached? Obama sent and rec’d emails via HRC’s private server. The email addy would have been the clue. still no word from Erik Prince’s vomiting NYPD detectives. Hope they’re feeling better. The biggest question is where is the server? No one knows including FBI (PTrump knows). We may see slow drip drip this whole mess in next few months it will be difficult for Dims. I read/heard somewhere that Mueller may be going after Prince. (Might have been on a Bongino podcast). Clearly Prince represents a risk the corruptocrats behind Spy-gate/Crossfire Hurricane. And given Prince’s past history (running Blackwater), I suspect that Prince has some fairly sophisticated ways to capture and hide documents. Remember too that Betsy de Dos is Prince’s sister. What she does or doesn’t know is perhaps not important, but there are certainly folks besides Guiliani within Trump’s circle that know all the gory truth. Some have said, and I think it is likely, that the damage that would be sustained by a full reveal (particularly all the creepy stuff with Epstein) would be the equivalent of a nuclear bomb in American trust for institutions–already at a low ebb. But aren’t there also contemporaneous calls to re-examine how the FBI handled Epstein? Not sure if that is just a counter-move against Mueller and the Dems, or the prelude to more revelations. There’s no way Barr’s gonna delve the truly radioactive stuff. At best there will be a polite chasing down of some corruption. It was indeed on a Bongino podcast recently that he predicted Prince would be the next arrest. Stuck in my mind as well because of the laptop! IIRC correctly it was also because of new plans by the seditious cabal to start looking into Middle Eastern Collusion. The whole mess is created in one assumption that Hillary will be president so better to save her and be a good pet. And then that didn’t work out very well. I thought PT’s response the ‘Lock Her Up’ chant tonight was very interesting. WSB, I missed that comment, thanks. If Sessions was merely duped, why wouldn’t he hold a press conference laying out the real facts as exposed in this article and discrediting the charade that was playing out when he was AG? If he is on Trump’s side, call for indictments to gain back some semblance of credibility. How does he get away with just resigning? He was kept and kept himself away from any material related to this whole thing. There is really nothing for him to contribute at this point. I wonder if this is an unusual case of nearly too much evidence taking so much time to work through? If there are hundreds of thousands of e-mails, text messages, “insurance files”, 301s, etc., does not the prosecution team have to go through it all to make a case? or a whole set of cases? There is the crime, the coverup, the leaks, the extortion, etc. What if the restaffed Trump DOJ instituted their set of FISA warrants? That could not happen until a whole lot of house cleaning took place. Any prosecutor would have hundreds more files than Sundance and he has gone through massive amounts of stuff just from the crumbs provided. I love how Comey admits to the political calculus that went into his announcement: how badly it would damage a President Hillary if it came out that she was elected while being investigated by the FBI- then made sure it came out that Trump was being investigated by the FBI when he was elected. So he knew EXACTLY what he was doing. All of these corrupt FBI/DOJ people were SES (Senior Executive Service). They are nearly impossible to fire. And there are THOUSANDS of these career obstructors all across our government. They could not be removed during the last shutdown because it was an “unplanned” shutdown and the laws would not allow reductions in forces then. What did have to happen after the first shutdown was a proposed Reduction In Force (RIF) plan in the event of the next shutdown. Meaning, they could go through and weed out who each department could do without. But this next shutdown, to begin 2/15, is PLANNED. And after 22 consecutive missed work days (which would be 3/21 since 2/18 is a holiday and weekends don’t count) many of the corrupt SES employees can receive their Reduction In Force layoff. It is these SES people that are the protectors of the Deep State and with them gone, the guilty can be held accountable. I hope and pray this happens and I am not expecting any arrests until after the next shutdown is over. This would be a great way to shrink the size of government. Could you create a small committee in the senate. Have them start reviewing each SES with a lie detector. Refer all liers to the DOJ for prosecution. Focus the questions on their involvement. Even if you could, there are precious few Senators who would be interested in firing government officials who vote for those Senators and help them retain power. Swamp isn’t gonna get rid of other Swamp. And to think the Senate is not part of the global clan. The actions of McTurtle prove otherwise. The SES (and its close equivalents in some agencies) are supposed to be the leaders That was the idea in the Civil Service Reform Act, under Carter. But they are not leaders (how can someone lead ehen nobody trusts them? ), they are simply unelected politicians. They are experts at working the system, networking, smooozing, and sometimes just plain grifting. They can receive awards in the tens of thousands of dollars, and are immune from any form of discipline. They area in which they excell is taking some silly notion and drveloping it into a program, which they then infict on the field, whose task it is to make it look like it is some great boon to the taxpaying public. Books must be cooked until they are well done, and important work must be placed on hold while stats are concocted to that somebody in DC can get the big payout. Among the many wastes of taxpayer money, the SES is at the top of the list. Unfortunately (for the SES employees) I haven’t read anything else that conflicts with your post. I don’t see anything unfortunate about what DeAnna tells us. I am very optimistic at this hope of clearing deadwood. Bring on the planned shutdown and start that clock ticking right away! Was reading through some of the 215 docs JW received. Some confirming (again) the FBI to media relationship. My memory is that FBI said they were going to reviews weiners laptop, and then in a miraculous amount of time they didn’t come up with anything. Strzok email from 11/06/2016 morning (pg198) indicates they will start the indexing and they should be done by evening with review. (this feels like all they really did) This email in the time frame of reviewing various drafts (pgs before 198) of what I am guessing is the eventual (predetermined) Clinton email outcome. All the docs from new release in case anyone interested. Paging Mr. Barr. You will have no choice but to address this mess. You can start with the DOJ legal opinion that required investigators to find a flashing neon sign from Hillary saying, “YES – I intended to mishandle classified information.” After that, you can look into the FBI HQ decision to not investigate the emails on the Weiner laptop. I’d recommend that you talk to the FBI white hats in NY, who were pushing for a search warrant, ran into a brick wall at HQ and got pissed off. Maybe they made multiple copies of the data after they sensed a cover up…just to make sure it didn’t get buried. Could the SDNY (i.e., 1PP, One Police Plaza in New York) have a copy of the Laptop Hard Disk Drive? I think – Yes, because they were bought off or because they expected to die later without an insurance of their own. You see, we are talking about people at the FBI and DOJ who were willing to take part in Treason. The penalty for Treason is life in jail or worse. Do I think SDNY still have a copy, you bet! Wouldn’t you? There are several good reasons for 1PP to have made a copy of the hard drive, and few if any reasons NOT to. Firstly, “chain of evidence”; you don’t want to accidentally mess up the original, when looking at it, so the FIRST thing you do is make a copy of the hard drive, and look at THAT. Secondly, if they assumed Hillary would win, its leverage for Federal funding, or to use to get the civil rights division to back off on investigating the next Gardener incident. But then, Trump wins. Once again, its leverage. And yeah, insurance to prevent arkanicide epidemic. Right off hand, I can’t think of any reason to NOT make an “extra” copy (in addition to the one they surely made i.e. chain of evidence). Nice one James M Rector! O’yes their is at-least one copy. One of us is confused. I thought 1pp (One Police Plaza New York) was the head office of New York Police Department and SDNY is the FBI branch known as Southern District New York (where Preet Baharara ruled). They are not the same outfit. It was the boys in blue (NYPD) who were sickened by the laptop contents, and the boys in suits (SDNY) who threatened the boys in blue if they pursued criminal activity revealed by the laptop contents. I hear Weiner is getting out of Club Ped in May. If he finds out that his laptop is under John McCains pillow, will we see a headline “Fallen Clinton Associate Caught With Backhoe Digging Up Arlington At 2:00 AM” ?? No Name was buried at the Naval Academy, not Arlington!! It would seem to me that Carlos Danger is safer in prison with his husband than he will be once he gets out. He just knows too much. Rosenstein’s behavior leads me to believe he is complicit. He may have been pressured, but probably not very much. Just look at his behavior. “There’s absolutely ZERO evidence of anyone looking at emails or scouring through laptop data…. and FBI Agent Peter Strzok has no staff under him who he discusses assigned to such a task…. and Strzok damned sure ain’t doing it.” Sundance how can that be? DOJ said the computer was reviewed. Someone “confirmed” to CBS that most of the emails were duplicates. DOJ/FBI show us the evidence this was done! So this review of Weiner’s laptop is all BS! The DOJ/FBI/msm in collusion to cover up the data on Weiner’s laptop and their involvement in the coup attempt. God help us get the truth out! Duplicate emails, sounds like a reasonable story. Let’s see if this holds up. FBI Agent Peter Strzok is in charge of this small group reviewing the Anthony Weiner laptop hard disk drive. A co-conspirator known to be a lier and someone willing to commit Treason against a setting President based on his text messages and his own testimony before congress. I think – NO! These emails were not reviewed and even this moron would have enough sense to keep some get out jail material. That may be a cover story. In order to cross-reference the two sets of emails (Wiener’s laptop vs original emails Hillary had provided), both need to be in electronic form in computer databases. The simplest example of such a database is the email program itself – like your email program you use. Your email interface fronts a back-end database that – for each email – has items populated like To:, From:, Cc:, Bcc, Subject:, Date/Time, and the body text of the email, plus any attachments. For each and every email. My understanding – correct me if I’m wrong – is that Hillary did not provide her emails in electronic form. She printed off paper copies. Can anyone verify or shoot me down right there? To get Hillary’s printed paper contents back into a computer, the paper copies would have had to have been scanned, like on a scanner – modern photocopiers can do this: they can print paper copies of what’s on the glass or they can send the scanned image to a file, like a PDF file. At that point, it’s still a simple image. You can’t compare images to jack sh1t in a computer in a way that’s meaningful to the task. The page images next need to be processed through OCR (optical character recognition) software that will convert lines on the image into lines of ASCII text of the sort I’m typing here, and of the sort that resides in that other database you’re wanting to compare to. Often requires manual intervention, as the OCR doesn’t get everything correct. The final step – or perhaps it can be made integral to the overall process – is to populate that scanned and converted text into a database – one that has the same “attributes” (To:, From: etc) as the other email database you’re comparing to. Only then can you make a cross-comparison between the two email sets, searching for ones that match up on all attributes and body of text. Date/Time would be particularly useful, as it’s specific and somewhat unique to each message. Was it ever even done for Hillary’s emails she provided printed paper copies of ? When was that described in published articles? I didn’t follow it closely as it happened, perhaps someone here did and can comment knowledgably. Note that the Wiener emails WERE in electronic form. They’re in the laptop. The question is: WAS IT? Sundance has expressed his opinion a couple times that it wasn’t (the laptop sat and FBI did NOT exert a concerted effort to download and cross-check”). I believe Sundance has intimated that was a lie and smokescreen (the frantic ‘weekend’ of computer cross-checking) – that it didn’t happen. An email database contains all sorts of “meta-data” – information about the email like long server addresses, routing, just a bunch of technical stuff that’s probably valuable for forensic examination. Even scanning and repopulating a database from printed copy will only have the stuff that’s of face value – the To:, From:, body of email text, etc. That CAN be used for a simple cross-check to another database. But it’s not as rich as having the meta-data too, which is lost unless one turns over an electronic copy of the entire email database in computerized form. Printing copies on paper is a way to stymie forensic examination and delay it, make it a far more lengthy and difficult task and less likely to be successful. Having done some of this work in a few isolated instances i can testify that it would be impossible to have a true review in the weekend that Comey and the FBI allotted to reviewing the emails found on Weiner’s laptop. Didn’t we just read (in JW trove I think), that this was the reason that a number of classified emails were not identified then. And since State Dept did not turn over all the emails before, how could there be a decent DB created before the Weiner laptop was found? I remember when Hillary turned over her 30,000 emails out of the 60,000 (the ones she destroyed were just the goat yoga class scheduling ones) and I SCREAMED out loud when I read that she provided only paper copies — that’s a lot of work to go to instead of simply making a memory card, etc., copy. And Captiva uses a Sql Server Database system as the back end!!! WHO HAS THE DATABASE FILES? Agree with all your reasoning, absolutely. However, Hillary was not smart enough to think of this herself. She might have been onboard but she didn’t think it up. That I can tell you. Printed emails aren’t emails…….they’re just mail. Related: if one simply made a list of the actions taken by Hillary such as the printing of emails, the use of “I don’t recall”, etc., a very simple and compelling case could be made that they could be explained by NOTHING OTHER THAN the desire to hide criminality! Use the old “If she was guilty how would she have acted differently?” approach- it is something the average person can grasp and a way to simplify a (purposely) complex mess! I was mostly speculating from very superficial experience as an email and pdf user, I appreciate expert email ITs confirming I was in the ball park. In email, I’ve done little more than hit “properties” on suspicious spam hitting my inbox, that’s where I’ve seen metadata with server routings and such that lie behind the “front page” of our emails. And I’ve scanned printed pages into pdfs at the office photocopier and used OCR to get the converted text into a Word document, that’s where I’ve seen that. And the errors that OCR produces that need hand intervention to correct or at least flag. And I’ve got a little database experience with Geographic Information Systems. So just a superficial user. Finally, Sundance brought us all back to firmer footing by referencing his July 20, 2018 post with his analysis of the weekend FBI “amazing things” investigation of the Wiener laptop – the one that Sundance judges didn’t actually happen. Looks like Sundance appended this current post with a lot of that content, probably because folks like me were unnecessarily going on long-winded speculation while he had already dissected the issue thoroughly last year. Quite simply, that was an old CBS report. Do you believe CBS reports? I personally do not, but do believe they report nothing that isn’t pre-crafted to support a desired narrative. Sundance based his assertion on the fact that there was zero mention of reviewing the mails in any of the discussions noted in the strzok-page texts or other internal comms. While that’s not 100% conclusive, given everything else the “tight team” discussed in detail (even if somewhat cryptic) one would reasonably expect some mention in their text convos of email content or laptop content other than emails had the FBI truly reviewed the hard drive. I remembered Sundance’s having reached a s judgement on it but didn’t remember the rationale. Now that you mention the lack of mention in the internal “tight team” discussions, I recall that Sundance article more solidly where he laid that reasoning out. I hope that case agent’s copy that he wiped wasn’t the only copy made. Thanks for posting this because reading it again with this information makes it more understandable. The key in your report last July was that despite the significant discussion by Strzok & Co. of how they reviewed the laptop, the conflicting testimony and IG report fails to corroborate their stories but does make most plausible the possibility that the laptop was buried (virtually or literally) along with any evidence that may have been found on it. GB thanks I agree! No of course I don’t believe CBS but I do believe Sundance! I was being sarcastic and I wasn’t calling out Sundance’s analysis but rather highlighting the msm involvement in providing Hillary and the FBI cover over the Weiner laptop at that time. 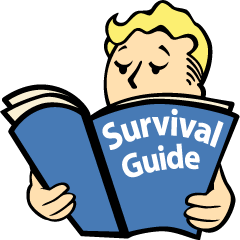 The msm always have some so called “experts” to bolster their fake news whether it’s the climate change hoax or the FBI reviewing laptops. My hope is after this email Judicial Watch discovered that someone sues the FBI for evidence that the Weiner laptop was actually reviewed. There has to some evidence of a computer program, FBI timesheets of the agents who worked on the review etc. This collusion between the msm and the deep state to cover up the coup attempt and Hillary’s corruption is about to be blown wide open is my hope and prayer! Godspeed President Trump! Is anyone going to ask Barr once he is confirmed the following……..
1) Why has no one in the FBI/DOJ looked at the DNC server that was supposedly hacked? 2) Why has no one from the FBI/DOJ looked through all 600K emails on the Wiener laptop? 3) Mr. Barr where is the Wiener laptop and has all the emails been erased? 4) Why has no one from the FBI/DOJ spoken with Assange? 5) Why has no one from the FBI/DOJ talked to the FISA Judge and also Judge Roberts who overseas the FISA judges about FISA abuse? 6) Why has no one from the FBI/DOJ audited the NSA database to see how many contractors accessed it and who was queried and who gave the contractors permission and what information was queried? Bogey free, and why has no one found out what top secret and confidential data the Awan brothers stole off the Democrat House of Representative servers….and whether those Congress members have been bribed/coerced/threatened because of such stolen information. Also, who did the Awan brothers sell this info to? Pakistan? Taliban? Turkey? Did it have any confidential military data or info? That would all be good to know. Consider: six weeks before Hillary is expected (without reservation from many corners) to be elected President Of The United States Of America. What could happen at that point that would be the WORST POSSIBLE DEVELOPMENT? Well how about: Anthony Freaking Weiner’s laptop containing the ENTIRETY of Hillary’s corrupt transactions before and during her gig at State is uncovered. I mean how’s THAT for timing?!?!? Do you think she peed her pants a little when she got that call from her lawyer? 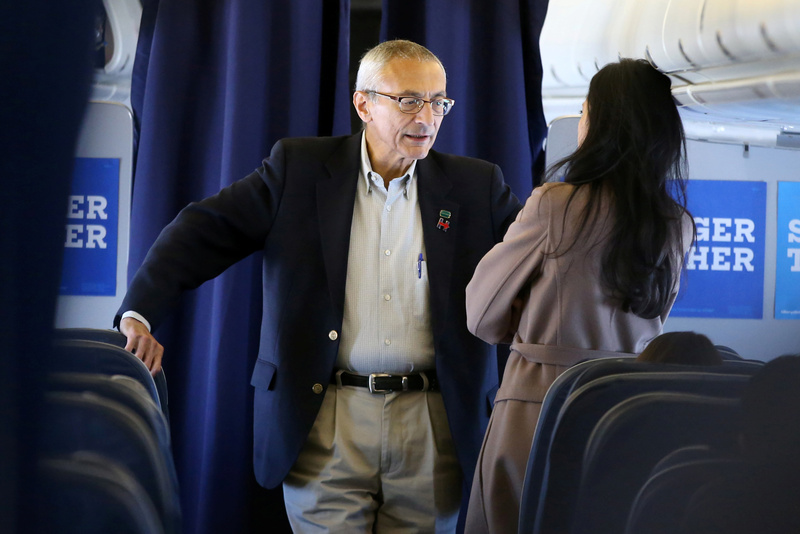 IIRC, She got “the call”, NOT from her lawyers, but ?’s from reporters, as her plane landed. 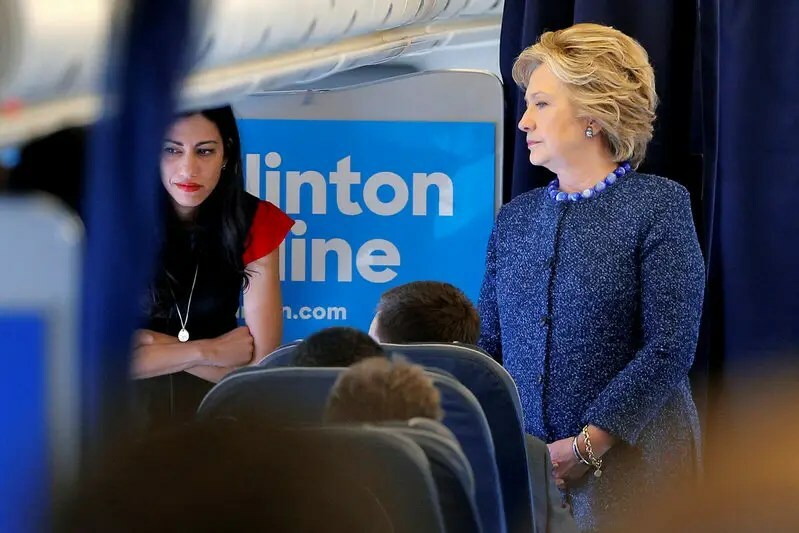 There is a photo of her glaring at Huma, and if looks could kill, well lets just say Huma would NOT have been exchanges messages with Lindsey at McCains funeral; she would have been waiting for John to join her. A truly ‘unscripted moment’, and QUITE telling. 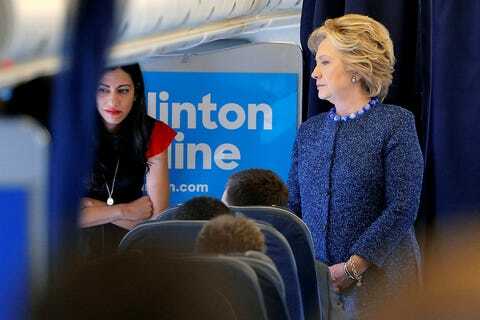 To me it appears Hillary is looking at whatever Huma is looking at, also the man seated by Hillary is also looking in the same direction. Something or someone has drawn the attention of all three of them. IMO the quote is an incorrect interpretation of what the camera captured. there are others to choose from, maybe someone else has a better preference. I was only guessing at the one James might have had in mind. I remember seeing one taken at that same time where she was definitely shooting daggers ( what’s larger) at Huma. I don’t know where to find it though. mr. piddles…the moniker fits you VERY WELL!!! The scope of this simply boggles the mind! This right here is why nobody at the FBI or DOJ has been seriously prosecuted for anything involving their cover-up of Granny’s emails. At some point, I can only hope a copy leaks. Perhaps it already has, since everyone is so interested in Assange. My understanding is that the Chinese already have a copy of everything on Hillary’s private email server, apparently a copy each email was sent from her server to a nearby Chinese business down the road too. And, the CIA was wondering why some of their agents in China were being killed. Meanwhile Brennan just stomps his little feet whenever POTUS triggers him again. Maybe somebody at the CIA wondered. I doubt Brennan ever did. It wasn’t just a few agents killed. Thank You, for the correction. …and “everyone” was so concerned that President Trump put himself in a position to be blackmailed by Russians. Methinks that spotlight needs to be shifted to our lady of perpetual misbelievings. Insofar as we’re asking basic questions about this. My first questions to Comey would be why Hillary got the “midyear exam” while Trump got “Crossfire Hurricane” moving into election season, 2016. It’s an interesting question that needn’t be answered once you look at the timeline. I was trying to keep it out of the gutter. I believe it IS an “endoscope” that they use. Lol. I didn’t consider it gutter talk just medical. I’ve had both done at same time. One is down and one is up. The procedures are to the ‘oscopy’ and maybe the instrument is the scope. “Thanks to the wizardry of our technology”… Who in the actual f*ck talks like this at a time of crisis unless they are up to something? I give tremendous props to CTH research for breaking this down in terms I could understand. This was exactly what the initial reports said it was. Operation Reciprocity from the remake of Clear & Present Danger with a new cast. Led by Obizzle my Nizzle and his head of State Lil Hill. Just look at these and see how accurate they predicted the behavior within. This was Orwellian when it came out but ironically Slick Willy was in office. Just watch em. . The book was published in 1989 so was written during Reagans term. That movie followed the book, although somewhat Hollywood-ized and of course significantly condensed. I have the hardcover book, bought and read in ‘89. Clancy was far more deeply researched and aware than he ever admitted in any interview (he had many). The corruption that brought about the humiliation in SVN continued through to today. Clancy merely captured some of the government’s standard, corrupt practices and willingness to sacrifice Americans lives for corrupt political goals. Hasn’t changed, only the newer technology improves their ability to engage in even more corruption. It’s a fantastic look Clancy gave us into the systemic conflict of interest that the CIA is and how it’s grown into a separate war mechanism that is perpetually funded by Congress and too sensitive to be given proper oversight. If I remember right it was founded as a corrupt arm of government by Hoover to keep his political foes in check. They’ve certainly made him proud all these years later. The book is always better than the movie. But when it’s something as complex as this the BSR doesn’t have the computing capacity to imagine the setting lol. Got cut off sorry. Roy Blunt takes his fair amount of criticism here which I like. But he and Democrat Claire McCaskill were absolutely two of the same. That’s the part that always frustrates me the most. We can call our senators all we want for any topic in the State of MO. But even now that Claire has been replaced both senators are beholden first and foremost to Boeing’s interests not ours. I started reading Clancy novels when I was about 10 and read them throughout my teenage years. This whole thing is “better” than every one of them. I just wish it were fiction. Exactly! Funny how real life is actually more diabolical than the plots in the best fiction on the same topic. I just remember Hillary saying “If that b**tard wins we’ll all hang from nooses”. We can hope and pray that we’ll get justice in the end because there must be accountability for this massive coup. And guess who has COPIES.. ? I still hold out hope that somebody in the NYPD has a copy of that information and will use it. Give it to Sundance hopefully. Lord knows the NYT and Washintron Post would bury it. It is very likely that Weiner made copies. They trapped him with a minor who posed as an older girl, just to put him in jail. MI think that Weiner and Abedin collected information as leverage because Abedin is complicit in Hillary’s corruption. Did we ever find out why so much info was on the husband’s laptop? Huma’s is understandable but why Weiner’s? Maybe Huma had sinister motive. “No, that’s not MY laptop” – that is, it’s not a gummint computer that was issued to her. It was one step removed. Why would anyone ever get Anthony’s laptop and find all of her stuff on it too? Oops – sexted a 15-yr-old girl. Why was the SoS’s email on yahoo? Clinton is responsible for her email & documents. Why were they on yahoo? For Huma’s part, I think I surmised from published articles at the time that Huma was forwarding emails from work to her home computer, for which perhaps her private email address was a yahoo account. Ostensibly, to make “print-outs”, I think she fibbed. Like they don’t have printers at gummint offices, right? Perhaps it was Huma off-loading her own private “insurance plan”? Wasn’t the bulk of it in a folder called “insurance”? For Hillary’s part, we know she had the shady server, lots of gummint stuff probably got forwarded there. Maybe she also used a private yahoo email, or perhaps she sent some stuff to Huma’s yahoo email. Someone up-page or on another thread mentioned Brennan and others using private accounts. It’s all just a great big free-for-all. Ah – and beyond possible over-the-internet forwarding, David Zink downthread points out that the Hillary/Huma content on Wiener’s laptop could have been “back-ups” – likely exporting email databases onto a memory stick at work and then uploading it to the laptop at home – that’d be the most likely way in this day and age. I suspect the email docs got on Weiner’s laptop via Yahoo. There is a theory…that when the laptops came within “range” of reach other there was an automatic download sequence that took place that the the emails were copied down. Which can happen. Esp. IF THE SOFTWARE WAS DONE BY A GOV PROGRAMMER…Pushing that many emails throughout the day to a cloud and then copying down…INORDINATE AMOUNT OF TIME and also to delete what is in the cloud!!! Those MOFUs!!! How I wish we still had public hangings for treason!! “It appears that your concerns were investigated by the Federal Bureau of Investigation (“FBI”). The FBI and prosecutors declined to file charges against Ms. Clinton, her attorney, or those who allegedly assisted her in deleting the emails. We are satisfied that the misconduct alleged was properly reviewed”. Equally problematic is Ms. Herman’s blind confidence in the FBI and Justice Department. Even before the FBI’s about face on Friday, I had already provided evidence that the FBI investigation was fundamentally tainted. On October 19, 2016, I emailed Ms. Herman an October 5, 2016 letter from four Congressional committee chairman to U.S. Attorney General Loretta Lynch regarding Ms. Lynch’s role and Mr. Comey’s role in the destruction of evidence. The letter can be found at http://tinyurl.com/gtkl2ap. As indicated in that letter, both Ms. Lynch and Mr. Comey were personally involved in the destruction of evidence sought by Congress, specifically the destruction of laptops belonging to Ms. Mills and Ms. Samuelson. To an outside observer, it appears that Ms. Lynch and Mr. Comey destroyed evidence to protect others who destroyed evidence, namely Mr. Kendall, Ms. Mills, Ms. Samuelson and, ultimately, Mrs. Clinton. For that reason, I filed bar grievances against Ms. Lynch and Mr. Comey in New York, where they are both admitted to practice. See October 20, 2016 Letter from Ty Clevenger to Grievance Committee of the U.S. District Court, S.D.N.Y. (http://tinyurl.com/hffys78). If Ms. Lynch and Mr. Comey were aiding and abetting the suspects they were investigating, as the evidence suggests, then it should come as no surprise that the suspects were exonerated. Either way, the FBI’s refusal to recommend charges says nothing about whether the respondent attorneys violated the professional rules. A more fundamental problem is Ms. Herman’s seeming disregard for the rules governing your office, particularly D.C. Bar Rule XI(6)(a)(2). That rule imposes a duty to “investigate all matters involving alleged misconduct by an attorney subject to the disciplinary jurisdiction of this Court which may come to the attention of Disciplinary Counsel or the Board from any source whatsoever, where the apparent facts, if true, may warrant discipline.” As a matter of standard practice, your office requires attorneys to respond in writing to misconduct complaints whenever those complaints state a prima facie violation of the professional rules. In this case, however, Ms. Herman bypassed the normal practice and dismissed my complaints out of hand without any genuine investigation. Why? I have read all of this plus the Bongino info, Sara Carter, Solomon, etc. The part that is never pointed out is that any review looking for confidential info would have included Huma, Mills, Podesta and others emails and ALL of their devices. A review of the server would have shown you all IP addresses that attached to that email system. Just finding these Huma emails from an obvious back up of her and obviously Hilary’s accounts so late in the game just shows what a farce the whole mid year review was and they should have all been fired for incompetence. When you see James Baker, Andrew McCabe, Peter Strzok, Lisa Page, Mike Kortan, Hillary Clinton, Comey. You will notice that they all have something in common. Arrogance, they know, they are not going to be touched. They know, they will be protected. So is powerful enough to offer them this kind of reassurance? Well it’s not the setting President, it’s not a common member of congress, how about the Gang-Of-Eight, how about a former setting President? Who is powerful enough to protect these people against Treason charges?